Denny Hamlin finished sixth in Saturday night’s NASCAR Sprint All-Star Race at Charlotte Motor Speedway in the #11 FedEx Express Toyota, learning valuable information for next weekend’s longest race of the season — the Coca-Cola 600 — on the 1.5-mile oval. Saturday’s 90-lap non-points, exhibition event was broken into five segments, with four 20-lap runs followed by a 10-lap dash to the finish line. A tight condition throughout the race prohibited Hamlin from challenging for his first All-Star win at the end, while Jimmie Johnson was victorious. Hamlin started seventh in his seventh-career All-Star Race, and stayed among the top-10 before rain brought out the caution on Lap 8. The persistent precipitation necessitated a red flag, and NASCAR brought the teams down pit road to dry the track. 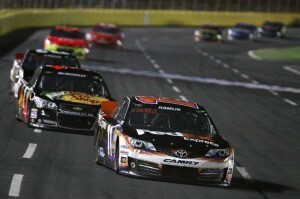 When the race resumed, Hamlin finished the first segment in eighth. The FedEx team used a variety of pit strategies following each of the first four segments to work on the car and gain track position, using two-tire stops following the second and third segments (after finishing ninth and seventh, respectively). Hamlin finished 14th in the fourth segment and his 9.5 average placed him ninth prior to the mandatory four-tire pit stop before the final segment. Quick work by the FedEx crew moved the #11 up to seventh for the final restart, and Hamlin gained one spot before the checkered flag. The Series returns to action on May 26 back at Charlotte Motor Speedway for the 400-lap Coca-Cola 600.